I colored Tilda with Distress Inks. For the skin, I used Tattered Rose and Tea Dye (shadows). 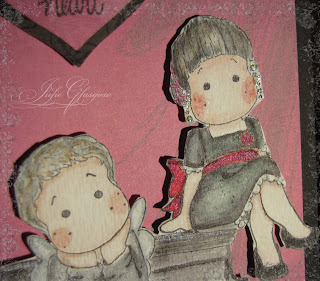 For her dress, I blended colors (I think it was Worn Lipstick and Tattered Rose). For her hair, I used Scattered Straw, a little Mustard Seed and a little watered down Walnut. The butterfly is two punches by Marvy. I embellished with some beads I had on hand for a little extra bling. 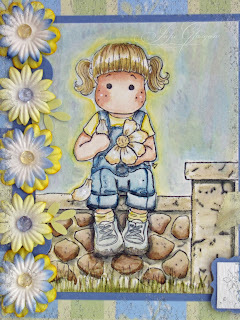 When I see Tilda all colored, I just think of a little ray of sunshine, so that is what I called this card. I used Distress Ink to color the image. I am really loving these inks. So much fun to work with. See you soon. Have a great Wednesday! 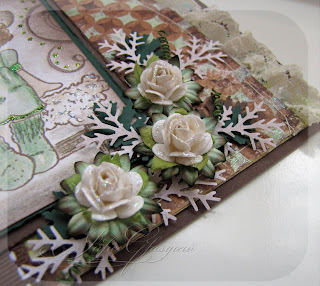 Welcome to the first of our monthly Magnolia-licious Christmas Card Blog Hops. 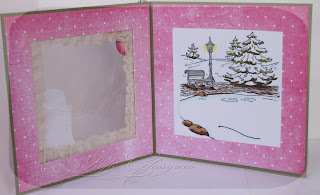 This group was created for Magnolia lovers who want to get a jump on the Christmas season by creating a Christmas card each month. If you are visiting this blog hop, I hope it will inspire you to get ahead of the holiday season and join us in our endeavor. Embellishments: Copics Airbrush System, Prima's, Leaf Punch (EK Success), Branch Punch (Martha Stewart), Organza Ribbon, Spellbinders Labels 3, Joann Craft Essentials Brad, Hodgepodge Hardware brads. 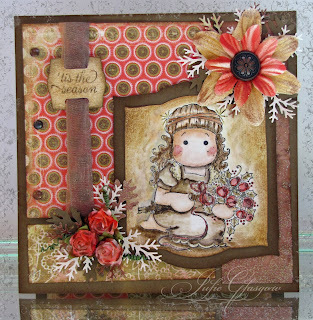 I went for the vintage feel with this card with lots of distressing and distress water coloring. 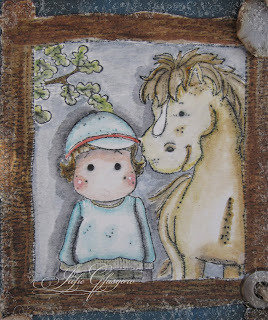 For Tilda's background, I did a combination of water coloring and sponging with 2-3 different colors. I used my Copics Airbrush System to color my white flowers to match the color scheme of the card. I just want to thank Deb from the Magnolia-licious Yahoo Group for all of the support with this Christmas group. 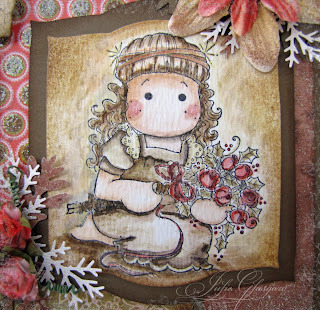 If you are not part of the group and would like to join, I would also like to say a special thanks to Diana for providing a special sale on a Christmas stamp each month in support of this Christmas Blog Hop. 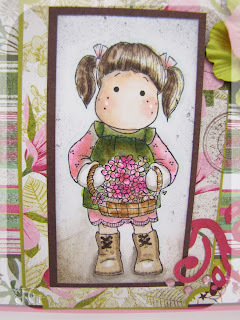 I hope you will go visit Magnolia-licious to see all the great Magnolia stamps she has to offer. 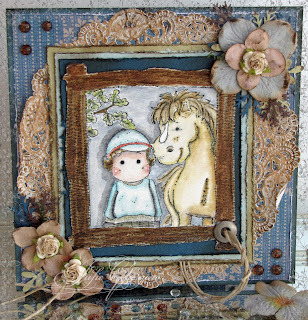 So from here, you can go to Barb's site to see her fabulous creation. 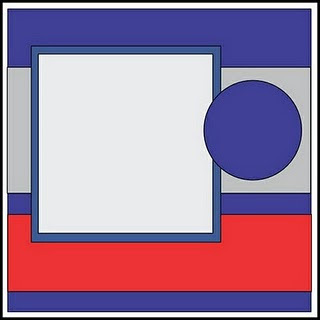 Then follow along and enjoy all the great creations! And then, come back and join us the 25th of each month for more Christmas inspiration. If you are interested in joining our hop in the future, you need to do a couple things. Join the Magnolia-licious Yahoo Group, and then contact me so I can send you the details and add you to the list. 39 comments that make blogging fun! So, I must say that this is is not my favorite coloring job. It is a result of the growth I am experiencing learning to watercolor with distress ink. I added to the challenge by limiting my color selection to black/gray and hot pink. In the coloring of her dress, I added some greens and blues to add some dimension to the black. 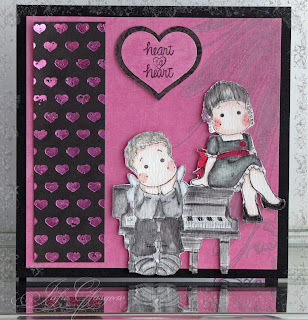 The inside of the card will say "You make my heart sing" (for my hubby). I took this closeup picture with the sun shining on the card, trying to pick up some of the shimmer. I added some Twinkling H2O's to the sash and shoes. I also added Stickles for the ear rings. It is so hard to capture glimmer and glitz. This card was a little stretch for me because it does not really have any extras, no flowers, no brads, no ribbon. I wanted to make it simple to focus on the image. 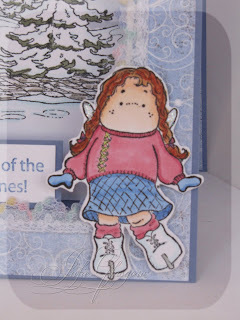 The embellishments are built into the papers (Rock Star - DCWV). Thanks for looking. 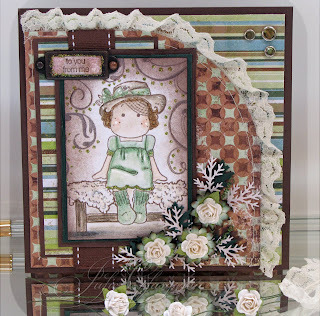 I hope you will join me Monday in our Magnoli-licious Blog Hop. Have a great weekend! 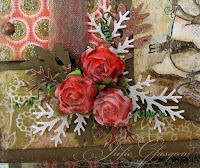 Embellishments: Martha Stewart punch, Prima's, Organza ribbon, Branch punch, rhinestones. For Tilda's dress, I layered some of the pretty papers and made her 3-D. The paper is somewhat iridescent, and really glimmers IRL. I had loads of fun with this one. 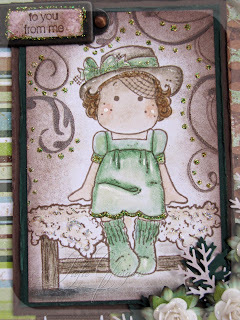 I hope you will come visit Monday for a special blog hop. It should be lots of fun! 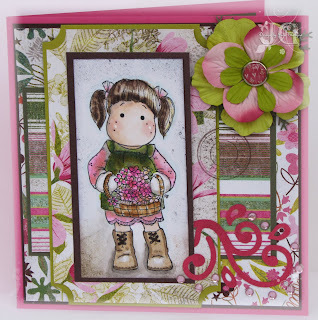 I am submitting this card for the Magnolia-licious Pretty in Pink Challenge and Blog Hop. In this picture, you can see the shine from the transparency a little better. I used a texture plate and dry embossed the transparency. It is easier to see this effect in person. 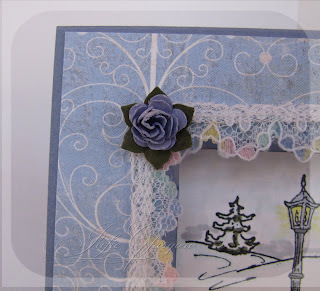 I sewed lace on the inside of the frame with the transparency to give it more of a window effect. 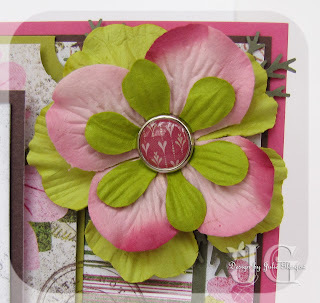 I used a die cut and Prima's flowers down the side and across the top of the card. 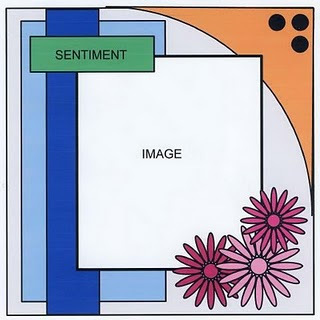 So, there is not really a great place for a sentiment, but you could do something fun around the edge (an after thought). 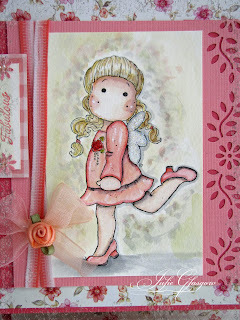 If you haven't already, check out the blog hop at Magnolia-licious Highlites. I hope you have a great week. 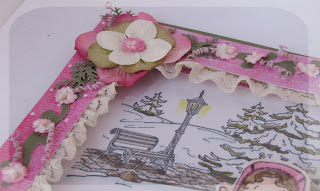 This post is rather different to my normal ones, no card just some very exciting news about a challenge and blog hop that will be coming February 1 that sounds like fun with a great mega prize. 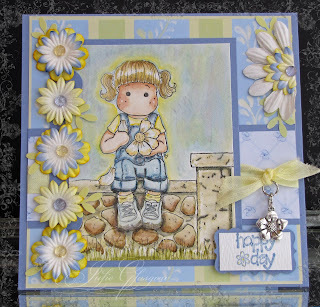 So hop on over to Brenda's Blog at Floral Fantasies for more information. 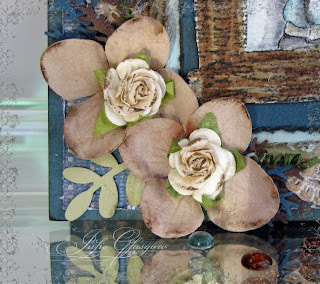 I created this for the Simon Says Challenge - Shabby Chic. What is shabby chic you ask? Shabby Chic is "showing signs of wear and tear, distressing, whites, worn or bleached out pastels, rustic" (courtesy of Wikipedia !!). What says shabby chic better than distress ink. I used distress ink to watercolor my image. 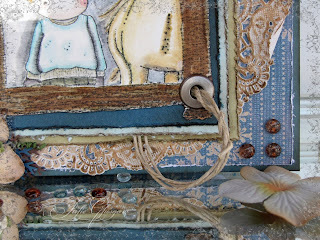 I used my distressing tool to distress the edges of the papers, and used distress ink to add some browns to make them "shabbier." 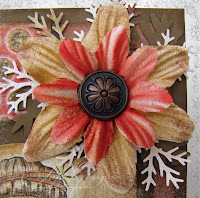 I used the distress ink to add some brown to the flowers to age them as well. I added some twine and a jumbo eyelet to carry over the western theme. The background circle is a doilie. I used a stain and distress ink to age it. 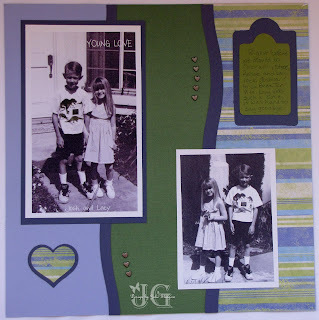 I decided to go another direction today and post a scrapbook page. This is my son when he was just a little guy (about 8) with our neighbor. They were so cute. They had this little crush on each other. These were taken right before we moved away from California. I changed the picture to black and white, but let a little color in the shirt (hard to see in the picture). It is really fun to alter pictures. You can capture so much, especially with black and white. I have more cards to post, so check back soon. Happy Wednesday! 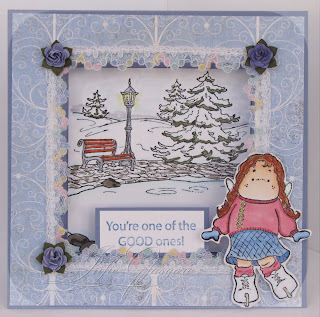 I created this for the Magnolia-licious Highlites January Challenge and for the Roses on Paper Challenge #29 Wintery (create a wintery scene). 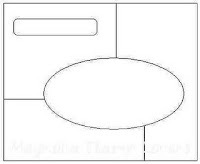 For this challenge, you have to visit Magnolia-licious Highlites for the template. Here is my entry for this challenge. I actually received a nice compliment from my husband (who supports my habit, but is generally not terribly interested). He said he thought it was one of my best to date. That was so nice. Makes it so worthwhile. I got this stamp when my daughter was ice skating. She has since stopped skating, but I still just love this little Tilda. Isn't she sooooo cute?! No, about this flower. I have mentioned in the past how much I love those little mini roses by Primas? Well, I wanted to figure out how to make them so I could have them in whatever color I wanted. 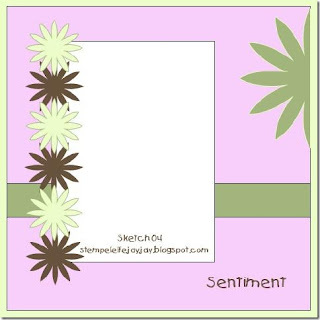 So, I used my Three For You Punch from Stampin' Up!. I had to clip them a bit with scissors. 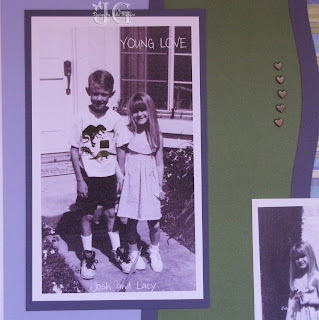 I used Mod Podge to stiffen the paper. 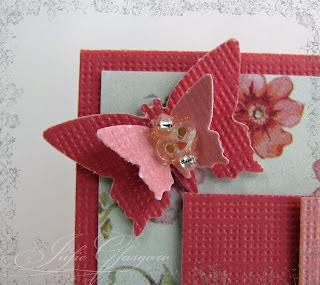 I then used my embossing tool, my piercing tool, and my fingers to form the flowers. I just love how they turned out. No I don't have to be limited trying to find them in the stores, and I have another use for my paper scraps. Yippee!!! I will try to be back Wednesday with another project. I played a little fast and loose with the glitter. 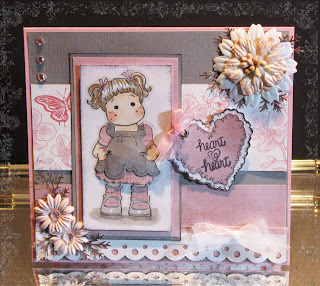 With the sponging and the swirls, I love how the background turned out. I love the distressed/aged look. I really like how she turned out. Under the roses are flowers that I bought off ebay. It was a miscellaneous lot. I just loved these flowers. The tips are colored green and brown. Very beautiful. I should also noted that I sewed the lace onto the cardstock. Check back soon as I have more to post. I hope you have a great weekend. Today's card is not for an official challenge, but a little challenge I gave myself. So, did the coloring effect work? Have I mentioned I love flowers. Here is a closeup of the flower.